Windows 7 Theme Aero Lite 1.0 is the best Windows 8 Aero Lite Visual Style available right now. It adds flat style of Windows 8 very realistically in Windows 7. Windows 7 Theme Aero Lite 1.0 is created by cold004. We published other great works by the developer before. You will need universal theme patcher to apply this third party Style. Unzip and Copy contents of “Aero Lite” folder to : Drive where Windows is (usually C) > Windows > Resources > Themes. Go to Desktop > Right Click > Click Personalize and apply Windows 7 Theme Aero Lite 1.0. It is a 11.4 MB RAR download, download and install according to your version (32 bit or 64 bit) of Windows 7. This Article Has Been Shared 8452 Times! 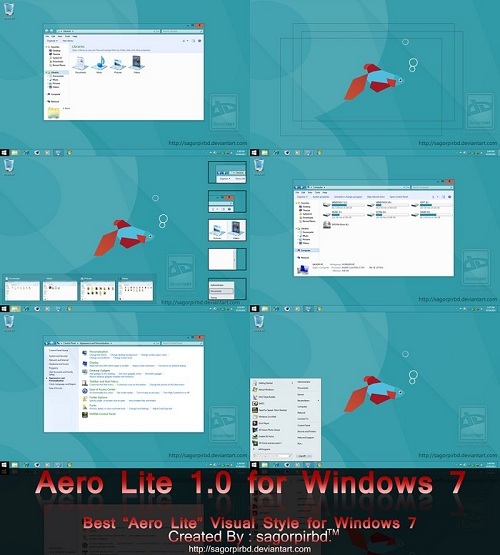 Cite this article as: Abhishek Ghosh, "Windows 7 Theme Aero Lite 1.0," in The Customize Windows, April 18, 2012, April 21, 2019, https://thecustomizewindows.com/2012/04/windows-7-theme-aero-lite-1-0/.